AS soon as the first drops of rain fell and traffic slowed to a snail's pace, the delay was inevitable. Mexico City's early evening thunderstorms had been "todos los días" (daily) but an accepted reality during summer - not unlike Queensland but colder. Even more reason to escape to paradise. Typically, upon exiting security at Mexico's largest airport, the boarding gate kept changing as rain caused havoc on flight schedules. With every minute the plane was delayed, it began to dawn on me that public transport options from Cancun airport to my Airbnb at Puerto Juarez were soon to be nought. On one of the gate changes, I met my lifesaver - Wilma. A wedding planner in one of Mexico's most beautiful locations, she was a Cancún local of 30-something years. She agreed my options were limited and, as we neared a midnight arrival, worried about the distance to my accommodation. While my guest room was chosen to enable early and fast passage to Isla Mujeres for one of life's great adventures, it was far from the airport and Cancun's main drag. "Està muy lejos y està oscuro," she said, concerned for my safety in the dark. When we got off the plane, my journey to Puerto Juarez was seamless. Not only did she offer for her husband to drive me into downtown Cancun, but we met up with her brother-in-law Jorge, a taxi driver, to take me the rest of the way. "Tengo mucha suerte a conocerte," I told her, considering myself the luckiest person to have met her. Jorge told me I would be his last ride for the night but wanted to ensure I got to my cama (bed) safely and offered to pick me up in three days' time for my return to the airport at a discounted price. By the time I arrived at Africa's home in a gated community, it was well after midnight but she greeted me with open arms. Having missed dinner in all the confusion of the evening, she offered me the most delicious sweet bread and a glass of apple juice. The perfect host. She also helped me sift through the ferry schedules online to ensure I made it to the island in time for my reservation a mere five hours later. Dragging myself out of bed after just a few hours in the airconditioning, my sleepy eyes were tempered with growing excitement. Whale sharks. I was about to swim with whale sharks. The season runs from May to September but the reviews all said they were most prolific in July and August. Within about 40 minutes of setting forth from the dock, we spotted one, then two, then so many it was hard to count. There was not yet another boat in sight on the glassy turquoise ocean before us. As I slipped into the tropical waters and peered through my snorkel mask, I audibly gasped. The first of these magical creatures drifted into my view. I was mesmerised as its oval-shaped mouth opened to filter feed any plankton in its path and then glided past me with the grace of a ballerina. The dots and stripes on its snout and body almost glowed, like it could light its own performance under the sea, and its gills, rippling in concertina fashion, had me transfixed. The docile creature was so long, it took an age for it to pass. As the tail fin finally passed, it flicked up and came within centimetres of my body. While we could not go deliberately within two metres, they did not mind practising an underwater tango of sorts. Before I had another moment to fully appreciate its beauty, another swept past on my other side. Then another and another. And, just as my go pro died, I encountered another wonder - the biggest ray I've ever seen. Known as the devil manta, it too had an oval shaped mouth and its wings swept through the ocean like curtains rippling in a Sunday afternoon breeze. 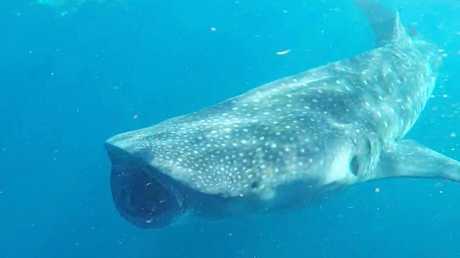 I have been lucky enough to swim with many kinds of sharks and rays in Australia, and nearby Bahamas, Belize and Panama, but whale sharks are next level. With only two humans allowed in the water at one time, we rotated through three turns each. I could have stayed there all day. But, alas, we left these beauties and "parked" our craft in the waters of Playa Norte - an Isla Mujeres beach with picture-perfect Caribbean water. 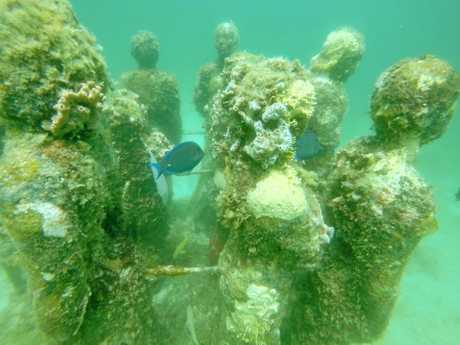 VIDEO: Fish make a home among the people: The Underwater Museum of Art (MUSA) off the coast of Isla Mujeres is full of interesting statues, made all the more interesting with the fish making the art their home. As we slipped from the boat again into the turquoise bathwater, our Searious Diving hosts passed out cervezas and plates of ceviche while we floated in paradise until it was time to leave. Next on my to-do list the following day was diving MUSA - an underwater museum of art. 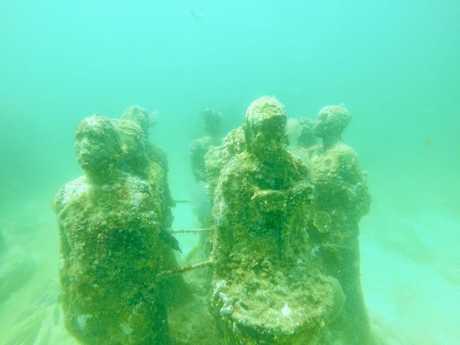 The statues, arranged about 9m below the surface, ranged from groups of people to a car, house and other random objects, all the more fascinating because coral and fish have made themselves home among these manmade reefs. Unfortunately visibility was a mere 1m or so the day I went so we could only see the art once upon it. 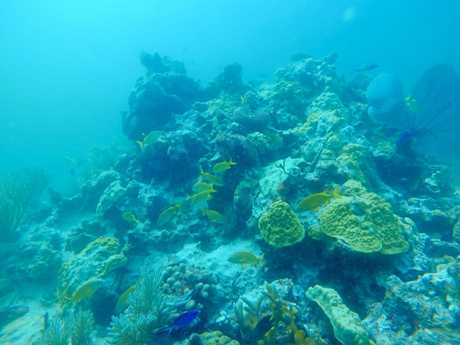 Conditions were similar with a second dive to nearby natural reefs, though the fish were stunning on each outcrop we discovered. While I did a certified dive, because the museum is only 9-10m depth, they allow introductory dives too. Don't bother with a snorkelling tour if visibility is bad. 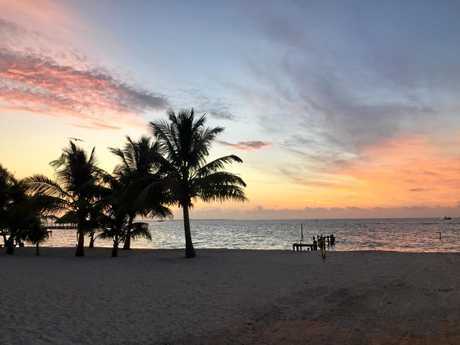 There were plenty of other marine activities available, including swimming with dolphins and visiting a turtle farm, but Isla Mujeres is postcard material in itself. Commonplace on many Caribbean islands and a stellar way to get around - golf carts. Taking in the salty sea air while breathing in the incredible vistas along the coastline leaves any troubles far behind. It's really living the life to drop in at the beaches for a dip and a cocktail or gander at the sculptures surrounding the lighthouse. There's even an ice bar to escape the heat for a bit. But after all the adventures, there's little more satisfying than soaking up the cruisy island lifestyle on a deck chair on the island's northern beaches. I was so chilled out between taking dips in the idyllic water and having tacos and cocktails delivered to my throne that my FitBit thought I had taken a long snooze. If you spot it on the menu, you can't go past the cochinita pibil (baby pig) dish revered in the region. Delivered in a juicy salsa, you devour it with accompanying tortillas like you would a taco. Don't be afraid to ask for more if you run out. Rooster, a breakfast joint in the main drag Miguel Hidalgo, is lauded for its eggs benedict options. 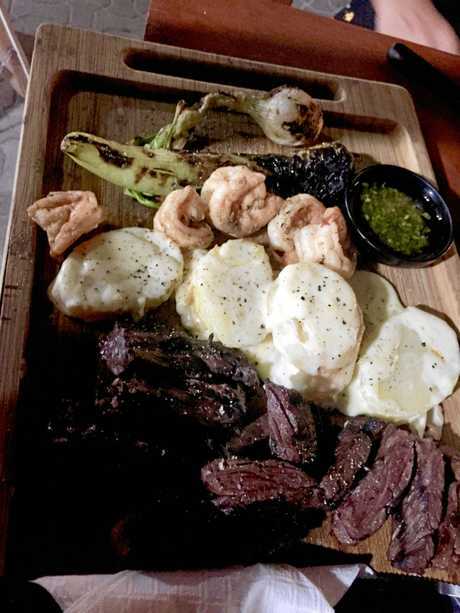 When they ask for your order - you will need to give your preference like you would steak - liquido, medio or bien cocida (runny, medium or well done). A pricey but delicious dinner option is Lola Valentino - scrumptious entrees, a surf and turf dish that will fill you to the brim and quirky, but delicious, cocktails. For a refreshing drink in the glorious heat, try either an horchata made from rice milk and cinnamon, or an agua de jamaica made from hibiscus flowers. Ice cream, known as helado en espanol, is sold all over the island. Keep an eye out for guanabana or mamey. They are delicious fruits on their own but even more delectable when made into ice cream. Of course, don't leave the island without trying the mango margarita. But if you want to be a bit more daring, try a tamarindo with a hint of chilli. Isla Mujeres is primarily a cash destination so make sure you have enough to get through your holiday. Only one ATM worked during my visit. Air conditioning is a lifesaver at night when the beach is not at your beck and call so check your accommodation is equipped. The first ferry to Isla Mujeres leaves about 6.15am (depending on the terminal) and the last ferry usually leaves about 11.30pm so make sure you book accommodation in Cancun if you have a late flight. There are three ferry terminals but they all run frequently so take your pick. Golf carts should cost about $1000 for the day or $600 for three hours. Shop around if you are pitched a much dearer price. TIMELAPSE: Take a golf cart ride around Isla Mujeres: Isla Mujeres is a small island off the western coast of Mexico, a short ferry ride from Cancun. 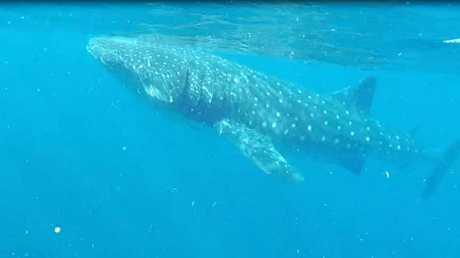 Whale shark tours are snorkelling only, not diving, and you are not allowed to touch the animals. If you see a tour that advertises otherwise, you could be fined if marine police catch you. Tour operators advise against wearing sunscreen to help the environment so take a long-sleeved rashie and long lyrca pants (I went with running pants) if you can. There were so many deals that come with securing a deck chair and umbrella by the shore that it's worth checking a few. Some offer $300-400 pesos for the chair that can be claimed back as food and drinks. Another offered $450 pesos for a buffet and open bar. Ignore the people trying to charge $US25 just for the privilege of sitting in a chair. The turquoise water is un-Belize-able! 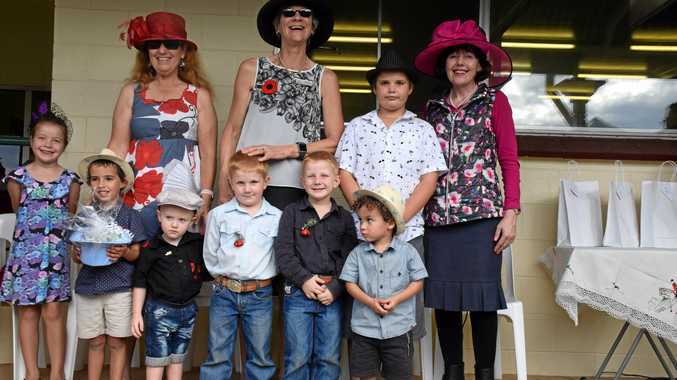 News Anzac Day was a busy morning for those who paid their respects, but for the large crowd at the Wondai Races, it was just as big an afternoon. Crime Thief charged with stealing from Roma Races.